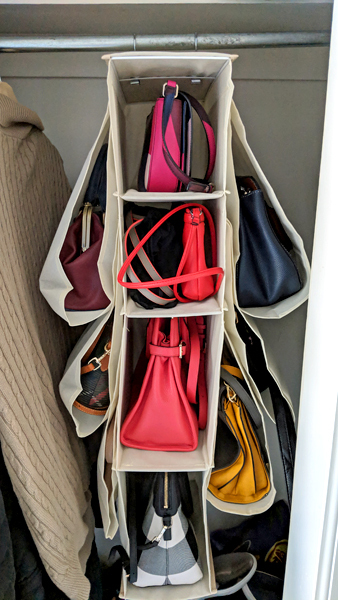 Today, I'm going to give a big ol' thumbs-up to the Longteam Hanging Purse Handbag Organizer. I tend to carry medium-sized bags, and all of them except for a tall bucket bag fit easily in at least one of the compartments. It's a really good solution for me, because I like to switch bags a lot. Each of my purses is ready to go with the basics of what I might need for the day — tissues, lip gloss, lens cleaning rag, an emergency dose of meds, mints, a pen, and a small notepad — so all I have to do is throw my wallet, phone, and keys into whichever bag I want to use that day. It took me a few tries to figure out a system that made my bags accessible but also compactly stored. I've had this a few weeks now, and it seems to be doing the trick. It takes up some space in the front closet, but less than when I had each purse individually hanging on an S-hook, and the convenience of having my bags in the coat closet is worth keeping a few more infrequently worn coats in a closet upstairs to make room.